sarahkatebranine: Rootin' for Spring . It's funny how one thing can affect so much, isn't it? Here in the pacific northwest, we're in our rainy season and haven't seen a lot of the sun in the past few months. I'd be lying if I didn't say that our little family is very, very ready for spring. (I'm guessing we're not the only ones!) Graeme is convinced he'll be donning swim trunks by next week. I've tried to tell him, in vain, that we're sometimes still wearing sweatshirts and holding hot cups of somethin' come July 4th around here! Today, though, we were given beautiful snaps of sunshine along with gusty wind and come-and-go showers. It was wonderful. I commented over on Instagram that I believe nothing breathes life into us more than light. (And what a wonder that Jesus is named the Light of the world!) And so, I took advantage of the sunshine slips today and pulled on the rain boots and planted some flowers. 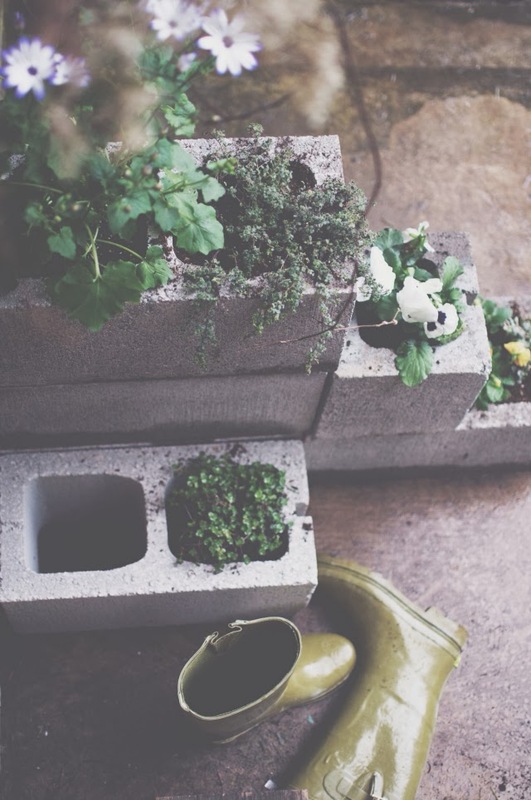 I'd been wanting to make a planter from cement blocks for some time now. Last week, I did some pinterest homework and found the one I wanted. Then, on Thursday afternoon, I stole Steve away for a surprise late-afternoon date and we stopped by Willamette Graystone for the blocks and Grey's Nursery for fresh flowers before filling up at our favorite pizza place. We love that kind of date! p.s. My advice for anyone moving to the pacific northwest is this-- find a home with large windows and generous natural light. And you'll be okay. Oh, and good friends and lots of warm cups of somethin'. (smile) Come on, spring! We're rootin' for you! I've used cinder blocks too in my urban backyard! It's a fun variation to all my pots - I've had to figure out how to make a plant filled backyard with only a patio slab! this post is crazy beautiful. It's true. We're a little bummed out about winter too. :) Lovely photos. I'm thinking of moving there. But after surviving many Chicago winters, I don't think a little rain will bother me so much!